Many campers, hikers, RV enthusiasts, and Doomsday preppers alike all realize the importance and usefulness of portable solar power. 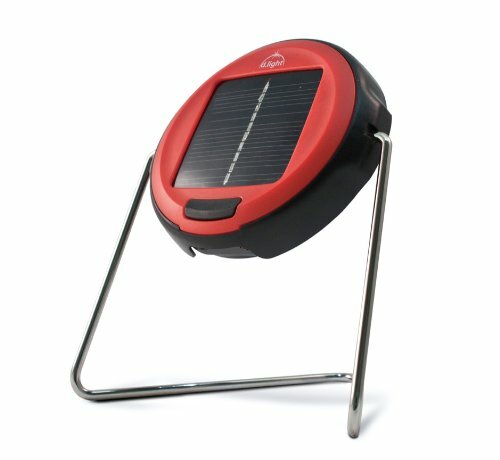 For emergency preparedness, an evolution to more solar power usage has occurred primarily because portable solar panels and related solar-powered products are now relatively inexpensive, compact, lightweight, safe, easy to use and they provide a surprising amount of long term renewable power and versatility. Plus having a sustainable source of power can be extremely important for long term survival in the wilderness or if the power grid goes down. Most people are aware that there are many threats to the power grid in the US including terrorism, natural disasters and economic collapse. Our power grid is very vulnerable due to outdated technology and lack of adequate security. At any moment, our nation could be taken back to the way life was in the 1800s. We could lose the benefits of electric power that we all take for granted, except for those who are now smart enough to make advanced preparations that include solar power. In a post apocalyptic world, solar power can increase security, productivity, and the well being for survivors. Having an adequate amount of solar power products in a Doomsday scenario can mean the difference between light and dark, feeling safe vs. not feeling safe, and even having cooked food vs. uncooked food without alerting others. Solar power can provide an improved ability to build and create, it can allow you to be more productive, and it can even mean the difference between life and death. If there does happen to be an extended or permanent nationwide blackout, you will be much safer and happier if you have planned ahead to include solar panels, rechargeable batteries and solar powered products in your emergency preparedness survival preps. For those Doomsday Preppers concerned about an EMP (Electromagnetic Pulse) that would destroy all unprotected electronics including solar panels & products, all of these items can be protected in simple Faraday cages. For example, you can construct your own Faraday cages with metal garbage cans lined with cardboard and bubble wrap inside. If you are lucky enough (or rich enough) to have large home solar power systems you are way ahead of the vast majority of US citizens. This article is not about the options available for home solar power systems, but is instead about some of today's best options for affordable portable solar power. Today's portable solar products are great for everyday use right now whether you are hiking, camping, traveling in an RV, or at home, and they serve the dual purpose of providing power solutions for emergency power outages and even for a longer term Doomsday scenario. The portable solar panels & solar powered products pictured below are some of the best, affordable, and useful products available today for everyday use, emergencies, camping, and hiking. But they are also great preps for Doomsday preppers who understand the importance of solar power for a long term survival SHTF scenario. Even though these are our top 10 favorite solar panel products in order, all of these are very useful and we had a hard time putting them in order. Any one of these could be your #1 depending on your priorities. We prioritized our top picks in order based on their usefulness as a long term Doomsday survival prep taking into account their functionality, size, and cost. If your priority is lightweight portable lighting, #3 should be #1. If your priority is total power supplied for a home or Bug-Out location and cost & size is less of a factor, then items #9 & #10 might be your #1. Also, we would have reordered these solar products based on usefulness for camping, hiking, and short term emergencies and some of these would not even make the list for camping & hiking. If you really want to be prepared with emergency power solutions you may not want to limit yourself to just one or two solar products and to just single quantities. The best affordable compact foldable solar panel that can charge 12V DC automotive & marine batteries, smartphones, tablets, head lamps, portable ham radios, power stations, power packs & more. It is everything you need in one small package. Inexpensive for a compact portable quality solar panel, controller, connectors & adapters. Included waterproof controller that can charge 12V DC batteries simultaneously while you charge up to two of your other electronic devices. No additional battery is required for charging external devices with this unit. Three output ports including one 12V DC port and two 5V DC USB ports. Included connectors and adapters that you will need to charge most power packs or any other 12V DC battery using the alligator clamps. Equipped with four of the highest efficiency mono-crystalline panels. Why a Doomsday Prepper needs at least one of these. In a Doomsday scenario, the Instapark 27W Compact Foldable Solar Panel would provide a portable and reliable way to charge many essential electronics (power tools, lighting, shortwave & ham radios, head lamps, etc.) and non-essential electronics (fans, razors, hand blenders, etc) that a prepper might really need or desire to use. In a real SHTF scenario, 12V automotive batteries could be scavenged, and the Instapark 27W Solar Panel plus a quality power inverter such as the BESTEK 300W Power Inverter DC 12V to 110V AC Sine Wave Inverter with 4.2A Dual Smart Ports would be simply invaluable. Without preps like these, electrical power will be sorely missed. In addition to scavenged 12V automotive batteries, the Duracell Powerpack 1300 portable power station is a perfect companion to the Instapark Mercury27 for camping, emergencies or even in a real Doomsday scenario. See our Review of the Instapark Mercury27 Foldable 27 Watt, 12 Volt DC & 5V USB Solar Panel Battery & Device Charger. Included are additional pictures, features, specifications, Youtube video, recommended accessories, and owner feedback. Very portable and lightweight. Outstanding for camping situations. You can bake potatoes, cakes, cook whole chickens, steaks, MREs, boil or pasteurize water with it, cook your emergency bulk supply of dried beans & rice, and much more. This oven gives off no smoke and you can do other things while your meal is cooking instead of tending a fire. Can reach temperatures of up to 285 F and is highly portable folding down to the size of a seat cushion and weighing just over 2 lbs. Includes a water pasteurization indicator (WAPI) that will tell you when water is pasteurized. Comes with collapsible black cookware. The silicone pots collapse to 0.875" thick and are good to 485 F. The pots are dishwasher, microwave, and oven safe. If it is very windy, you may need to put bricks or rocks inside on the corners to help keep it from blowing over (not a big deal really). In a end of the world Doomsday scenario, the Sunflair Portable Solar Oven would provide a way to cook food, boil or pasteurize water without having to tend to a fire and have an increased risk being spotted by others due to seeing or smelling smoke. This solar oven and cookware are also easy to transport and clean. Having the ability to work around your camp doing other things while your food cooks mostly unattended is a huge advantage versus maintaining a fire. You can fix your shelter, gather food & water, etc., using this solar oven and remain hidden from far away eyes. Granted, you'll still need to build fires to remain warm and cook at night depending on the weather, but there will be plenty of times that you will be glad to have one of these solar ovens. 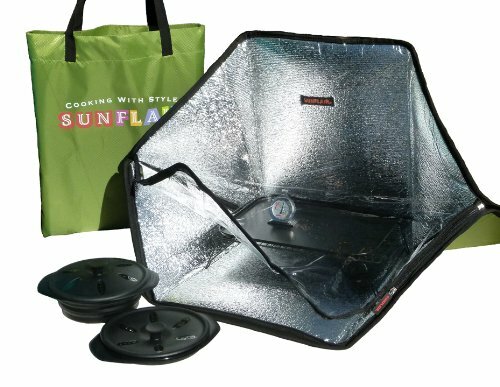 See our Review of the Sunflair Portable Solar Oven with Complete Cookware and Thermometer. Included are additional pictures, features, specifications, Youtube videos, recommended accessories, and owner feedback. Surprisingly bright and compact solar rechargeable light. Great for camping, during a power outage, or for everyday use as a powerful flashlight or task light. Very inexpensive, compact, weighs almost nothing (0.33 lbs.) and will easily fit in your Bug-Out Bag. Designed as a replacement for kerosene lanterns for rural off-grid households in developing countries. It only takes approximately 6 to 8 hours to fully charge. Will charge even in indirect light. Rated for 4 hours, but even after 7.5 hours it is still putting out usable light. Will last longer than 5 years with no battery replacement. Has a removable adjustable handle that can be detached, carried, hung or placed on any surface. Can replace all of your flashlights. Rugged design protects against weather, impacts, dust & insects. Completely maintenance free rechargeable batteries never need replacing. All other components are also maintenance free. Not really a con, but you will want to buy a lot of these once you buy and use one. This amazing little solar light is one of the best preps we can recommend. We have at least two of these in each of our vehicles, Bug-Out bags, day packs, home, and Bug-Out location. Removing the handles allows you to more easily pack several of these in a Bug-Out bag, day bag, or backpack. Not truly waterproof. They are "water resistant" meaning they can take some wetness, dew or a light shower at least. In the reviews people report leaving them out to charge without regard to the weather and they survived getting wet from rainfall. In a Doomsday scenario or even a power outage, the last thing that you want is to be left in the dark. The d.light LED Solar Rechargeable #S2 Task Lights are simply fantastic. They put out a surprisingly bright light for tasks but you'll also be amazed at how well they can light up a room for hours instead of being in complete darkness. They don't take very long to charge using only 100% solar power compared to other solar lights, and these do not cost much at all. These amazing lights are very bright and they easily recharge everyday even in indirect light. They are super light (0.33 lbs.) and have a removable adjustable handle so they are easy to position for lighting and also for charging. Having several of these in your vehicle and bug-out bags means that you'll never be without light for many years. We depend on these lights as the best solar lights we've seen and we own/have owned many other models and these win hands down for lighting. See our Review of the d.light LED Solar Rechargeable #S2 Task Light. Included are features, Youtube videos, owner feedback and other models. An entirely portable solar panel charging system in one! Also available in a smaller 60 Watt version. Lightweight suitcase equipped with two 50 Watts monocrystalline panels, a 10 Amp ViewStar Series Charge Controller with an LCD Screen for power regulation, a 10ft. tray cable. Compact design makes it very portable and versatile. 100 Watt version folded size: 20 x 27 x 3 inches. German made solar cells have excellent performance in weak light environments and yield better energy over the long run. Adjustable corrosion resistant aluminum stand, heavy duty handle and latches for longevity, and protective casing. 10A built in negative grounded charge controller with LCD display and fully adjustable parameters setting provide over-current protection, reducing fire risk. Alligator clips for simple and direct connection to battery. Can recharge your 12V DC batteries for power needs in everyday situations like for RVs, tailgating, and camping, or even for Doomsday preppers in a long term survival scenario. This kit is that it is already put together, and it folds into an easily portable suitcase, and is therefore easier to move around and store when not in use. This one is ready to go. Just put it in the sun and clamp it your 12V battery posts with the already attached 15' battery cables with alligator clamps. You do have to buy a DC to AC power inverter separately and have 12V DC batteries to charge, or you can buy a Power Station and possibly connectors for it but that's it. Note: Sometimes the manufacturer has an option to ship this package without the Controller. To buy the exact controller, here is the link to the Viewstar VS1024BN PWM 10A 12/24V Solar Battery Charge Controller. This would require that you install & wire the controller, but that's pretty easy to do. In a Doomsday scenario, for the exact same reason we noted that preppers need our top rated Instapark Mercury27 Solar Panel, a prepper would desire the Renogy 100 Watt Portable Solar Panel Suitcase to charge many essential electronics (power tools, lighting, shortwave & ham radios, head lamps, etc.) and non-essential electronics (fans, razors, hand blenders, etc) that a prepper might really need or desire to use. The basic difference is that Renogy is larger and more costly, but is also almost 4 times more powerful so it will charge batteries faster. If you can afford the Renogy and the larger size is okay, then it may be a better option, or do like we did and buy both! They are both excellent choices. See our Review of the Renogy 100 Watts 12 Volts Monocrystalline Foldable Portable Solar Panel Suitcase. Included are additional pictures, features, specifications, Youtube videos, recommended accessories, and owner feedback. An off-grid must have. Keeps your smaller battery powered electronics working for a long time in a Doomsday survival scenario. Charges 11 different NiCd and NiMH battery sizes (AAA, AA, C, D, and 7 GUM sizes). Charges two Rechargeable Batteries of the same type and size (D, C, AA, AAA) simultaneously. Charge time is between 1 and 9 hours in full sun depending on the battery size. Two AAA batteries will charge in 1 hour, two AA batteries will charge in 3 hours, two C batteries will charge in 6 hours, and two D batteries will charge in 9 hours. Adjustable top lid and bottom stand for optimal sunlight exposure and a blocking diode to prevent battery discharge. Compact size. Weighs 11.8 oz. and is 6.8" W x 4.5" H x 2.3" D.
Hinged cover can be angled for maximum sun exposure. Built-in meter shows you the following conditions: The strength of the sun, the strength of the current out-put from the solar panel, and the time required to fully charge the different types of batteries. May have to move it a few times to maximize charging. Takes a long time to charge a lot of batteries (but that should not be an issue as all of your devices will likely not require new batteries all at the same time, and you can share batteries between devices if needed while charging more). In a Doomsday scenario, a lot of your battery operated electronics are going to fail when you eventually run out of batteries. Just think of all of the devices that you have now that run on AA or AAA batteries that you would like to continue using long after a Doomsday power grid ending event. The Solar 11-in-1 Battery Charger is an excellent way to charge rechargeable batteries and is the best solar powered small battery charger available that we have seen. See our Review of the Solar 11-in-1 Battery Charger. Included are additional features, Youtube video, recommended rechargeable batteries, and owner feedback. High quality, but inexpensive. Better made than most similar models available. Waterproof Level: IPX3, can be used during rainy weather (see Cons). 2000 mAh rechargeable battery supports long working times for lighting and radio including about 12 continuous hours of the LED flashlight or reading lamp or 4 - 6 hours for the radio. Charges your cell phone or other USB chargeable device (such as a headlamp) via the USB cable. Battery can be recharged by the solar panel, hand crank or Micro USB. 1 minute of hand cranking supports 25 minutes of light and 10-15 minutes of radio power. Has AAA battery backup capability. A selector switch on the front allows you to choose whether to use the three AAA batteries, or the built-in lithium-ion 2000 mAh hour battery. 45-Day Money Back Guarantee, 12 Month Replacement Warranty, Lifetime Support Guarantee. Waterproof level could be better. IPX3 means you can spray your gear up to 60° from the top of the device. It cannot be submerged in water, but it can be sprayed from above (up to a 60° angle) with the device in its standing position. So it would survive most rainy weather if it remains standing vertical. Solar panel is more useful to keep the device power topped off, although several hours in the sun does provide enough power to use the unit for a short time. The hand crank is amazing though. Difficult to tune weak channels. The RunningSnail "Swiss Army Knife" Of Solar Power Fits In Your Hand! In a Doomsday scenario the RunningSnail Solar Crank AM/FM NOAA Weather Radio, Power Bank & Flashlight is the Swiss Army Knife of solar power! This is a high quality, phenomenal piece of emergency gear that serves multiple purposes. Without a doubt, every home should have one in their emergency kit. When disaster strikes, there are several critical components that help during recovery. Communications, information, lights, emergency power, to name a few. The RunningSnail Emergency Solar Crank Radio offers all of these features with a few extras, to boot! It is an excellent tool to have on hand following any disaster. With less than a minute of cranking, you can listen to the radio, use the flashlight, and read with the reading light. Perfect security lighting for your garden, backyard, deck, porch, patio, pond, veggie patch, driveway, or any outdoor location that needs a light. Higher quality and more reliable than many other comparable models. Completely contained maintenance free system installs easily and quickly to a wall, post, fence, or tree. No wiring necessary. Just insert a small pin to turn it on before you mount it. It only takes 6-8 hours to fully charge in direct sunlight and provides up to 12 hours of continuous lighting with a single charge. Will charge in indirect light. Since it is usually not on continuously, it typically works fine even after cloudy or rainy days. Night sensor only allows solar light to come on during the dark. Infrared Motion sensor states it has a sensing range of 10 feet with a 120 degree sensing angle. However, one of ours is placed about 14 feet up from the ground and it lights up an impressive 25 feet circumference. The motion sensor activates when you get about 12 feet from it. Surprisingly bright light turns off 30 seconds after motion detection has ended. IP64 waterproof and works in temperature extremes found from Arizona to Alaska. Solar panel life span: 5 years - LED Life Span - 50000 hours. Only one mounting hole. Can be mounted with one nail or one screw. Drill additional mounting holes if needed or use black zip ties to assist in mounting to a pole or tree branch. In a Doomsday scenario the URPOWER 8 LED Outdoor Solar Powered Waterproof Security Motion Sensor Light would provide security and could be used in multiple ways. The obvious use is to light your pathway and to scare off trespassers. However, if SHTF, two more uses of these lights are possible for defense and for hunting. First, put these out away from your home, bug-out location or campsite, so that approaching trespassers are "lit up" away from you. You would still be in the dark, armed and ready to defend yourself if needed. For another use in a Doomsday situation, one of these could be placed on a game trail at night, while you are hidden nearby and ready with your firearm. Note: Spotlighting deer is illegal in normal times like today. Rugged, 100% maintenance free construction. Rainproof & waterproof to 45 feet. Two charging methods - hand crank dynamo or solar panel. Easy to keep the battery charged between normal use by either cranking the hand dynamo or placing the flashlight in the sun during the day. Never needs any batteries or cables to recharge. 1 hr sunlight charge = 120 min low, 90 min hi and 140 strobe. Hand crank for 1 minute = 80 min low light, 60 min high light and 110 min strobe light. No output port for charging other devices. If you need that capability, this is not the flashlight for you. Solar panel output is low so it can take 8 hours (or more) to fully recharge the flashlight when the battery is completely discharged. Depends on how much direct sunlight you have available. The hand crank will quickly charge the device though, so the solar power slow charging is not a big deal. No indicators (LEDs) to show battery level or if unit is charging when cranking the dynamo or when placed in the sunshine. In a Doomsday scenario the Secur Waterproof Hand Crank - Solar Powered LED Flashlight would provide lighting for preppers at anytime, even outside in a rainstorm. This is one flashlight that you will not need to worry about getting wet in a bad rain storm. This is an all-in-one emergency power solution with enough power for even power hungry refrigerators, microwaves, heaters, and more. 5000 Watt Peak Solar Generator can be used for back up power, camping, tailgating, emergencies, blackouts, & Doomsday. It can be used indoors because it has no noise or fumes. 200 amp hour battery bank (two 100 AH batteries) for long run times on lighting and less power hungry devices. Rugged & Portable Case with Wheels. Comes with 30 feet of solar cable for connecting the panels to the unit. Can expand capacity by adding more Solar Panels and/or batteries if needed. Expensive, but a great value AND it qualifies for the 30% Federal Tax Credit. Bulky and heavy, but still portable. Because of weight, the generator and batteries will ship separately. Simply place the batteries inside and connect two sets of wires. Continuous running of power hungry devices will likely cause the need to expand capacity by adding more Solar Panels and/or batteries, so that would add more costs. In a Doomsday scenario the Be Prepared Solar 2500 Watt Solar Generator will power refrigerators, microwaves, heaters, and more. Any combination of appliances and devices that total under 2500 Watts can be powered simultaneously. It can be used indoors because it has no noise or fumes. The unit is perfect for backup power in any emergency or blackout. Great for camping and outdoor events too (before Doomsday)! Quiet, portable power for camping, tailgating, cabins, unexpected power outages, and Doomsday. Output: 400 Watt, 33 amp hours. Power lights, CPAP machines, power tools, mini fridges and TVs anywhere with built-in AC inverters. Chainable with other Goal Zero Yeti 400 for longer run times. Other smaller and larger capacity models are available. Use a compatible solar panel. Plug into a regular wall outlet. Plug into your car 12V adapter. Two USB ports for USB powered devices. One 12V port for all of your 12V power devices. Two A/C outlets for all of your 110V devices. Takes a long time to charge by solar. A 90 watt solar panel takes 9 to 18 hours to fully charge a depleted Yeti 400. You will probably want to get a 100 watt solar panel if you plan to charge this device by sun power. In a Doomsday scenario the Goal Zero Yeti 400 Solar Generator allows you to live life off the grid, camp in luxury, or power through an outage without the noise and fumes of traditional back-up generators.